Hi everyone! I’m Danae from Recipe Runner and I’m so excited to be guest posting for Ashley while she is off galavanting and having the most wonderful time in Napa! Let me just start by saying I am completely jealous that she is enjoying all the wine, food, and scenery that Napa has to offer. If you’ve never been there you MUST add it to your list of places to visit! I had the pleasure of spending a couple days there two years ago and it was magical! I had actually just run a marathon in Sacramento in the morning and then we drove from the race to Napa. After running in hurricane like conditions for 26.2 miles, the sunshine and cool breeze were a welcome sight. My only regret is that we didn’t get to spend enough time there. Enough about me reminiscing and being envious of Ashley and her vacation, lets talk about these cute as can be Mini Pumpkin Cheesecakes! Guess what?! This is my first pumpkin recipe that I’m sharing for fall! I figured I’ve waited long enough and so have all of you. The mornings here in Colorado are getting a little more crisp and my running clothes are slowly transitioning from tank tops to long sleeves (yes, I base my seasons on what kind of clothes I’m running in). With cooler weather on the way, but fall not officially here I figured a no bake pumpkin cheesecakes were the way to get this pumpkin party started. I don’t know about you guys but no bake desserts are always on the top of my list along with cheesecake! 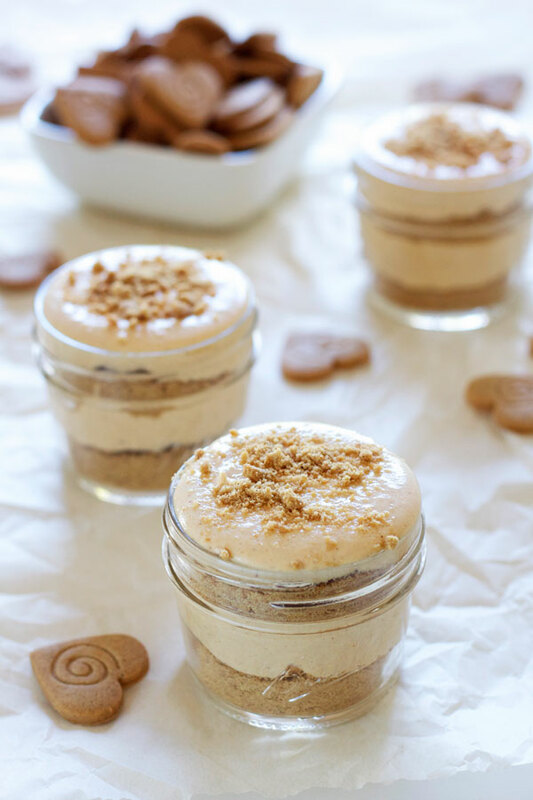 What’s great about these Mini Pumpkin Cheesecakes is they are pretty healthy as far as cheesecake is concerned. I know, cheesecake and healthy don’t seem like they belong in the same sentence, but it’s true! 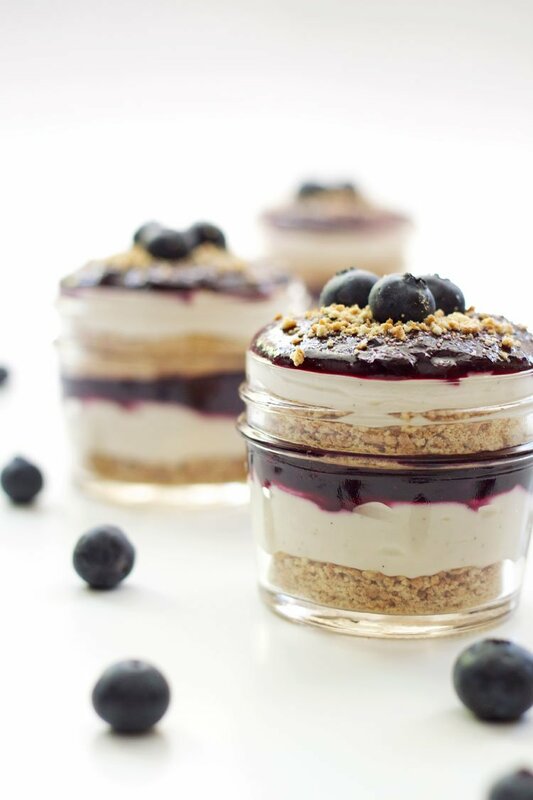 These no bake cheesecakes have a secret and it’s name is Greek yogurt. The Greek yogurt gives the cheesecakes the same creamy consistency that cream cheese or whipped cream does, but without all the fat. Since these are CHEESEcakes I did use some cream cheese, but I opted for the lighter version, because honestly I can’t tell the difference between it and the full fat when I’m combining it with other things. The other flavors you’ll find in this cheesecake are the usual suspects. Pumpkin of course, duh! Brown sugar, cinnamon, nutmeg, ginger, cloves, and vanilla. Everything you love about pumpkin pie only better because it’s in a cheesecake! 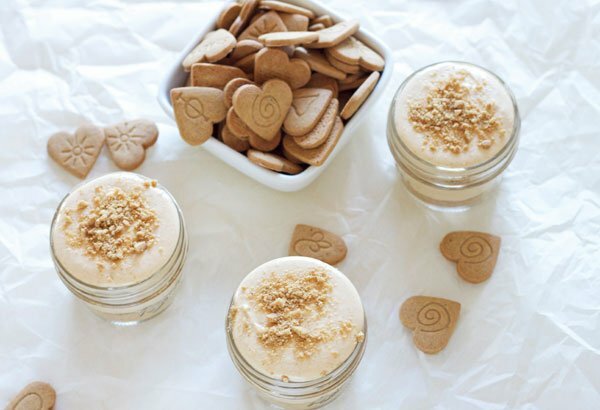 The “crust” for these mini pumpkin cheesecakes is simply crushed gingersnap cookies. I could have just served these in small bowls or glasses, but I have a slight obsession with mason jars and think they are the perfect way to present mini desserts. Not only do they look cute, but pop the lid on them and they are super easy to transport and make the cutest most delicious gifts! I brought these over for my cousin to try and she was thrilled to have her own little cheesecake in a jar. The cheesecake was gone in a matter of minutes so you know they must be good! So what are you waiting for?! Pumpkin season is here! Start your fall festivities off with the cutest, creamiest, and most delicious Mini Pumpkin Cheesecakes! 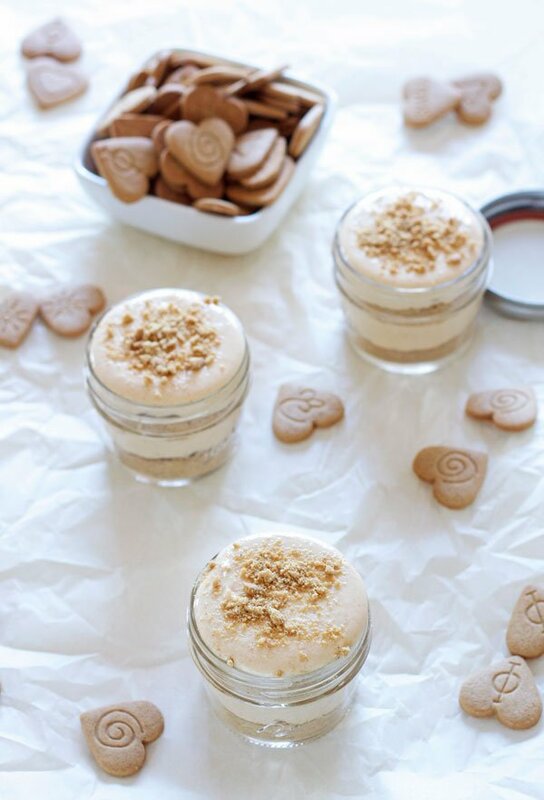 Cream, no bake, mini pumpkin cheesecakes are not only delicious, but cute as well! Place the gingersnaps in a large ziploc bag, seal it, and use a rolling pin to roll over them until they are fine crumbs. In the bowl of a stand mixer or with a hand mixer add the remaining ingredients. Using the whisk attachment, beat the cheesecake mixture until it is smooth. 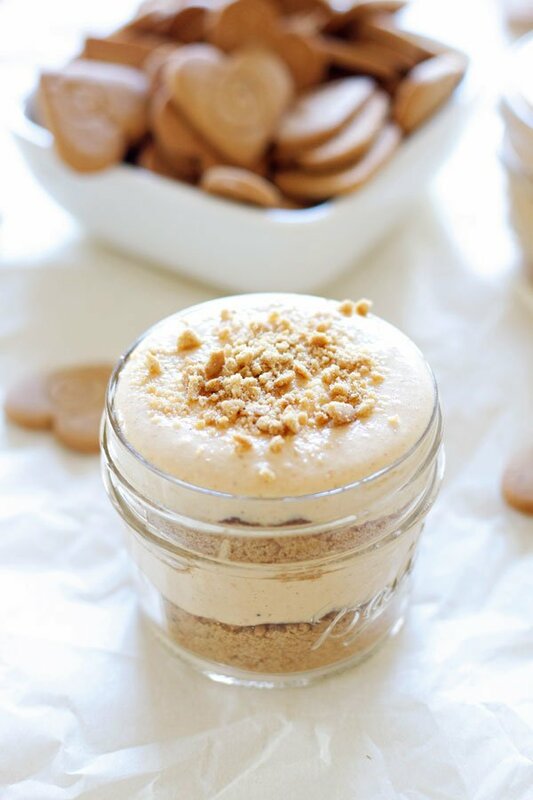 In 4 (4 ounce) jars layer the crushed gingersnaps and cheesecake (about 2 tablespoons of each per layer). Other Cheesecake Recipes You’ll Love! too many great recipes to try!! Love the idea of a pumpkin cheesecake! 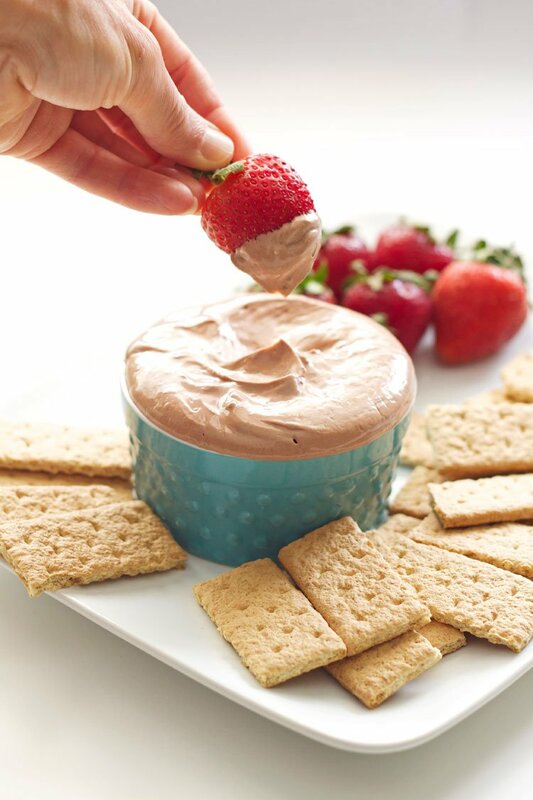 Great recipe and love your presentation of them.. pinned! They look so beautiful! Would decorate any table! Man I would love one of these! What gorgeous little treats! I love that they are no-bake! And pumpkin.... I have yet to make my first pumpkin dessert of the season - too many great recipes to try!! I can't decide what to make first! Love seeing you here Danae!! 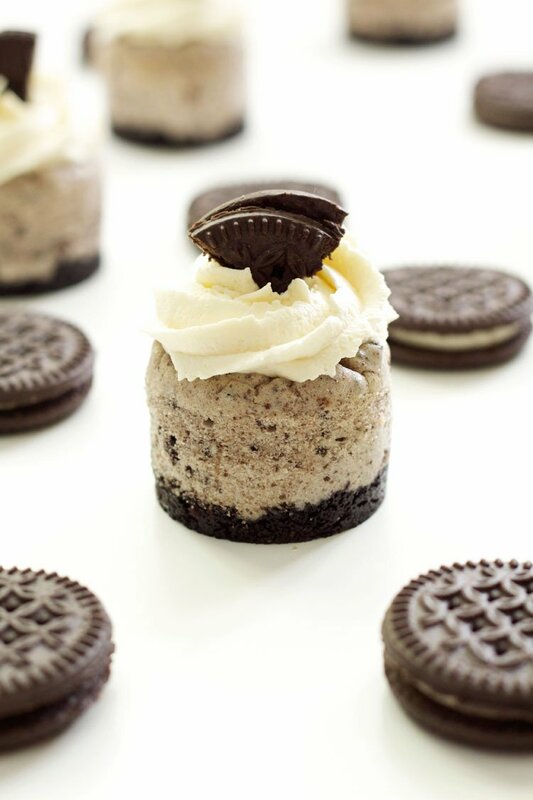 These mini cheesecakes are so beautiful and look tempting! Ashley so jealous of your trip. Keep having fun!! love love love no-bake desserts and thanks for the introduction to Danae! And hello?!!! NAPA?! I am sooo jealous by the way. . have a great time and hope there's a post coming soon about it!!! Thanks, Alice! Yes, there will probably be a few posts on my trip to California because there is so much to see and do here! I am absolutely loving these!!! Healthy to boot! These are the perfect treat! I am totally loving those heart cookies too :) Fun to see Danae over here! !